We got an unexpected gift today from a friend of ours. Many thanks to our friend. YUM!! Lucky! 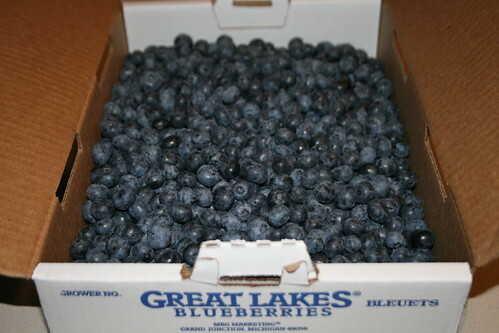 My kids eat blue berries like candy, just totally plain. But we also love to do blueberry pancakes and muffins. Enjoy those- I wish I lived close enough to come taste some of your crisp! I wish we lived in Indiana...I forgot it was just a week or two after Eliza was born that we went on the biggest blueberry picking/binge session of our lives and got ourselves completely addicted. Yum, yum, yum. ooh fun! yum! the crisp looks good! !